The year is off to a great start: I’ve already fulfilled my New Year’s Resolution, and it’s only February. A few years ago I discovered, rather by accident that an event was happening in a parking lot/outdoor cinema space around the corner from Brown Paper Tickets’ office. The event was Ignite Seattle and their tagline is: “Enlighten us, but make it quick.” I borrowed a chair and joined the audience. And it was amazing. Incredibly inspiring, sometimes funny, sometimes poignant, but always informative. With 16 speakers, each allotted a total of 5 minutes and 20 slides that advance automatically; it really was a quick way to become enlightened. 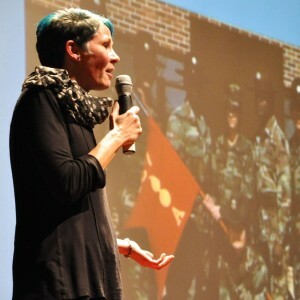 Ignite Talks began in Seattle in 2006, and now they are hosted worldwide. A couple years after my initial discovery, Ignite Seattle began hosting some of their quarterly talks at Town Hall Seattle, a vibrant performing arts space I worked at when they were just starting out. I’d been on that stage hundreds of times, but only to set up the lectern for a speaker, arrange chairs for a spelling bee, add music stands for an orchestra and to occasionally say, “Test 1, 2” for the sound engineer. The open submission format of Ignite gave me an idea: I could propose a talk. If selected, I could actually speak from the stage in the Great Hall, that grand room I had spent much time preparing for others. Last January, I read, The Life-Changing Magic of Tidying Up by Marie Kondo. After I finished clearing out my closets and paperwork, I applied the techniques I had learned to my finances. And then my relationships. And finally, to my job. I set out to find true purpose. 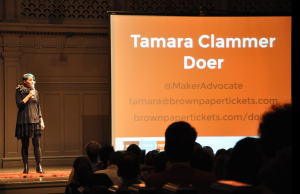 Even before becoming a Brown Paper Tickets Doer, I was already actively encouraging others to learn. Reflecting on what matters most to me, I realized that learning is a vital aspect of my life, but that it hasn’t always been easy. My school years were a nightmare. At the beginning of this year, the Call for Proposals for Ignite Seattle #29 crossed my Facebook feed. Suddenly, I knew that if I could tell my story, in that beautiful space where I was already comfortable, I could fulfill my goal of someday speaking from that stage while simultaneously leaving behind the weight of my past. Perfect. I applied and my talk was accepted. Through the process of writing my talk and locating corresponding slides, an interesting thing happened: I stumbled upon an article, “The Catch-22 of Gifted Underachievement.” Since I was already thinking back to my early years, I read the article and recognized myself in the writing. My “condition” has a name: “Twice Exceptional,” or 2e. Gifted, but with a learning disability. Underachieving? Lazy? Worthless? Sure. I’d heard these my entire early life. I was a failure, and it was all my fault. I was too sensitive. Too squirmy. Too day-dreamy. Too curious. Too weird. Now there are people who understand and they are spending time and effort to research and improve the systems, so that children like me can not only survive, but thrive. Through the process of writing my Ignite talk, I discovered the 2e Newsletter, SENG and a renewed sense of purpose. Yes, Ignite, you did enlighten me – and it was quick. Tags: education, gifted children, public speaking.